Written by: KristaG on April 21, 2017. Launched on Kickstarter in 2015 by Matthew O’Malley of Black Oak Games, Knot Dice is not your normal dice game. In fact, Knot Dice is not just a game, but actually a collection of games, puzzles, and, in my opinion, a well crafted conversation piece. 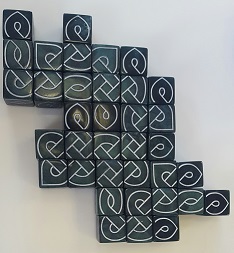 With the use of specially designed dice, players are able to create and explore different types of Celtic Knotwork. After their successful campaign, Knot Dice was officially released in 2016. Knot Dice comes with 2 booklets, 18 custom d6s (36 in the Deluxe Edition), 8 wooden discs, and, if you have the Deluxe Edition, a cloth bag. Within the booklets are 7 puzzles and 12 games respectively. The games include Kells, Kells: The Book, Kells: The Abbey, Knot so Fast, Knot so Fast Too, A Celtic Yard, Osbox, Tri da Coillte, Snakes, Knot the Whole Story, Distance, and Minarets. Out of all of these, my favorites were Kells: The Abbey due to the vertical building mechanic and Tri na Coillte (or “through the woods”) because of the dice movement mechanic and the depth of strategy used. These games were designed by 8 different designers so there is a lot of varying styles of play available. 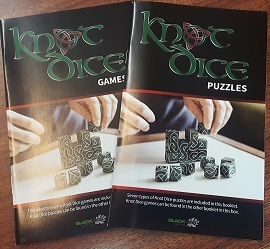 Both of these booklets are included in each copy of Knot Dice to add variety to your play. 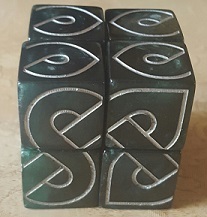 All of the games require 18 Knot Dice to be played, but a full 36 can be used when adding additional players for some of the games, which makes having the Deluxe Edition well worth it. Certain games even have solitaire options, so I can play these on my own as well as with my game group. 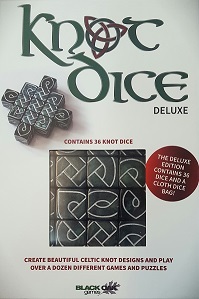 There are also games that are specifically for 2 players, but most can be played with up to 4 (sometimes adding another 18 Knot Dice is required for the extra players, but this will always be explained in the rules for that particular game). Set up for each of these games tends to be very different from the others, but they are all well explained in the Knot Dice Games booklet. A completed 2×2 Building Puzzle. The designs are continuous around each of the visible sides (so, not on the bottom). As previously stated, there are 7 puzzles included with the game, but I really should say that there are 7 puzzle types as there are instructions for more than 1 puzzle of each kind. The different types are: Completion Puzzles 1, Completion Puzzles 2, Transformation Puzzles, Creation Puzzles, Building Puzzles, Wall Puzzle, and Oxvo. My favorite out of these was the different building puzzles as I found it pushed me to get a bit more creative as I built my vertical solutions. Since these dice are so versatile, it is easy to come up with additional game or puzzle ideas of your own. They are good quality and, honestly, quite beautiful. These are dice I would proudly display on a coffee table or desk while allowing others (or myself) to fidget with them. I feel Black Oak Games has created a fantastic product and I am looking forward to seeing more from them – especially potential releases of more puzzles to challenge myself with! In the mean time, however, I will simply continue to explore my own knot-making abilities.